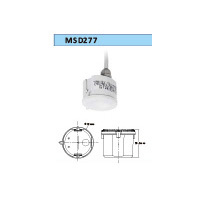 MC018S/MC019S is an innovative motion sensor, switch on the light detection of movement, and switch off after a hold time when there is no motion detected. As built-in daylight sensor can read brightness value, the sensor does not switch on the light if with sufficient natural light. Automatic switching based on motion and light level. Without sacrificing PF of luminaires (MC019S). Zero-crossing point operation – helps protect the sensor against in-rush current. 8GHz high frequency microwave (C-Band license-free operation). 4-pole press-in terminal (L, N. N, L’), easy assembly. New innovative and active motions sensors with Merrytek special design. Updated zero-crossing detection circuitry, helps protect the sensor against in-rush current when switching. Normally, the sensor supplies daylight threshold settings 5lux/15lux/30lux/50lux/Disable (Set by DIP switch). If the exact setting range above cannot meet demand of users, or the daylight threshold need to be reset after installation, rapidly switching off or switch on 3 cycles within 3sec can easily reset the daylight threshold from 2lux to 500lux according to current ambient light level. Also, the daylight learning function can solve the problem that the ambient light may vary a lot when passes through cover of luminaires, users can set threshold value according to real need. Basically, MC019S has the same size and sensor data with MC018S. But MC019S has a wide input operation voltage 120-270Vac. And more importantantly, MC019S adopts switching power supply and does not affect PF of luminaires when connect the sensor in circuit.